The Alvin Show is an American animated television series. It was the first to feature the singing characters Alvin and the Chipmunks, although a series with a similar concept The Nutty Squirrels Present had aired a year earlier. It lasted for one season in prime time (October 4, 1961 – September 12, 1962) on CBS (Wednesdays, 7:30-8pm Eastern), originally sponsored by General Foods (Jell-O, Post cereals), and initially telecast in black and white (color prints of the episodes were not seen until the series entered syndication in the fall of 1965). 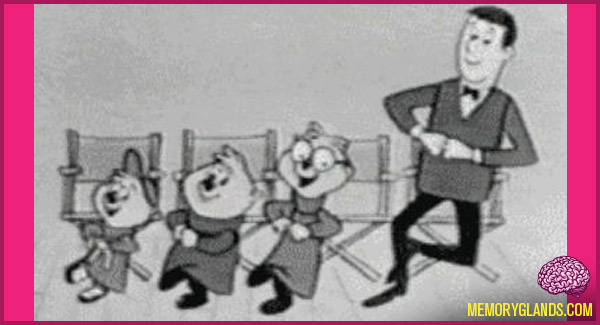 The series rode the momentum of creator Ross Bagdasarian’s original hit musical gimmick and developed the singing Chipmunk trio as rambunctious kids–particularly the show’s namesake star–whose mischief contrasted to his tall, brainy brother Simon and his chubby, gluttonous brother Theodore, as well as their long-suffering, perpetually put-upon manager-father figure, David Seville. The animation was produced by Herbert Klynn’s Format Films.